I got back home yesterday after a short trip to Hyderabad and am down with a bad sore throat. Sipping on loads of ginger tea and trying to find my blogging mojo. Looked through my drafts and found a couple of recipes that are blog worthy. One of them being a simple classic Andhra style vegetarian fry using cabbage, chana dal (bengal gram), coriander leaves and coconut. 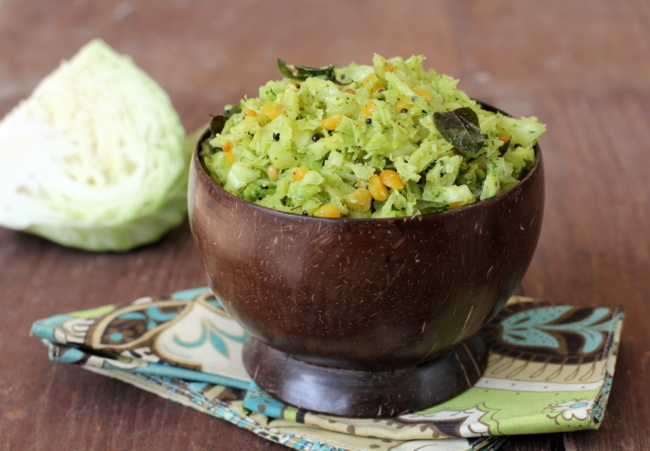 This cabbage fry is for all those readers who request for veg Indian food recipes that are quick to make and healthy. 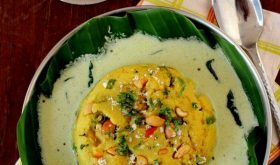 This Andhra style veg recipe works best when you are in a rush and have to fix a quick nutrition rich meal. 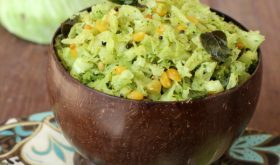 Cabbage fry fits the bill and you have a super satisfying stir fry side dish to go with rice, pepper rasam and papad. Makes for a comforting winter mid day meal. 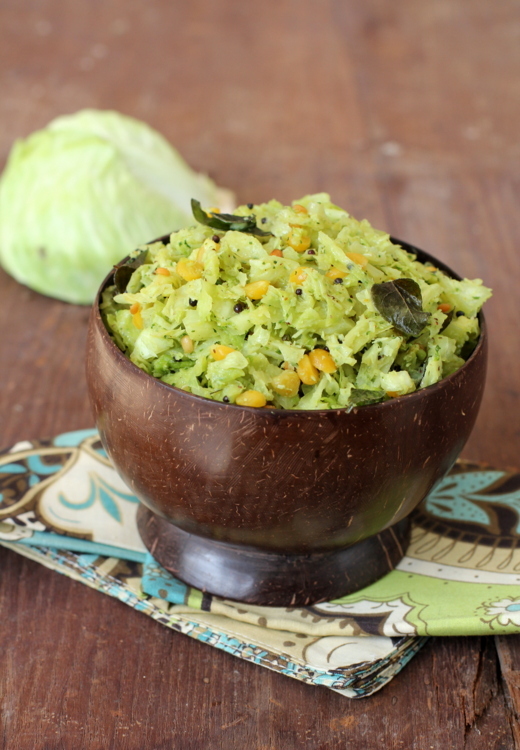 In a vessel, add 1 1/2 cups of water, shredded cabbage, soaked chana dal, turmeric powder and pinch of salt and cook till cabbage is almost cooked. Drain any left over water and keep aside. Heat oil in a kadai or cooking vessel. Once the oil is hot, add mustard seeds and allow to splutter. Add curry leaves and asafoetida and mix. Add the ground coconut-ginger-coriander leaves-green chili paste and cook for 3 mts. Add the almost cooked cabbage and chana dal and mix. Cook for 9-10 mts. Adjust salt. Turn off heat, remove onto a serving bowl. 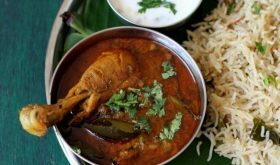 Serve warm with rice, rasam and papad. By Sailu Published: November 24, 2012 Among the classic recipes of Andhra, Cabbage fry stands out for simple flavors and easy preparation. 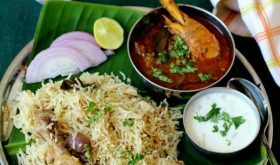 Veg Indian food at its best with minimal spices. abba entha bagundoa… I always cook but I really don’t know this will be so attractive. Just a doubt, by draining the water in which cabbage is cooked,wont the nutrition be lost? Add just enough water so that the cabbage is cooked and less water is drained out. Usually a cup or a little more than a cup is enough for a head of cabbage. I agree with you Mahima…..I would start with Step 2 and add the chana dal. When it is (almost) done I would add the cabbage and everything else. That way nothing is lost and the dish would still taste good. Cheers! If you carefully go through the ingredient list above, you will find I have mentioned ‘Grind Coarsely:’, and below it the ingredients that need to be ground. Thanks for your quick to make and healthy Idian Food repcipe. I really don’t like spicy foods. 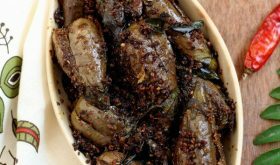 What would be the great substitute for the green chilies? awesome looking pictures. feeling hungry at 5 AM. I must try this at home. 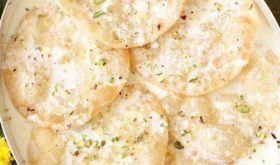 Sailu thanks for sharing you recipes. I did make your Oats upma this morning. It turned out really really good. May I ask how many cups of shredded cabbage did you use. It says 1 head. The size of the head varies quite a bit. This would be approx 4 to 4 1/2 cups of shredded cabbage. The cabbage that we get here is full of water. In fact could you suggest a method wherein I could get a drier version of the vepudu? I love the Indian cabbage but not the western ones. Do not place lid and keep stir frying constantly on high flame.